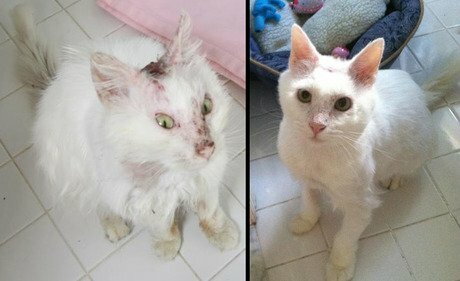 On April 11, 2012, CatTime.com reported on Snow, a white cat in Sterling Heights, Mich., who was found burned by what authorities believe to be some type of acid. A picture of Snow from April 11 (left) and a shot taken on June 25 (right). You can check for updates on snow on his Facebook page.